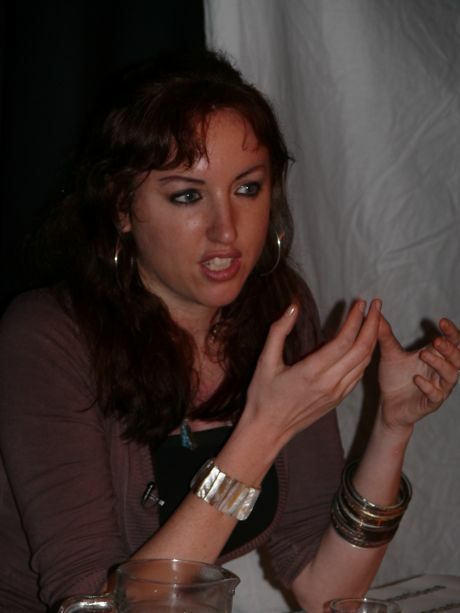 Caoimhe Butterly is an Irish peace and social justice activist who has worked in Chiapas, Mexico; Jenin, Palestine; Falluja, Iraq and presently in Lebanon. I caught up with Caoimhe last December during her speaking tour of Ireland to hear about the situation in Lebanon and about some of Caoimhe's experiences. A: You've been working in Lebanon with Palestinian refugees for the past two years. Can you tell us what you've been doing, who you're working with and what the situation is there at the moment? C: I've been working in Lebanon for almost two years: the first year of that; was in a Lebanese community in a village called Aita al-Shaab which is on the border with Israel. I went to the South initially during last years war and was working with a collective of volunteers called Samidoun ; a group of activists, volunteers, people with medical skills, artists, community activists; who all came together and sort of overcame sectarian-lefty divides to do something practical on the ground during the war. We initially worked with displaced families during the bombardment of the South. When the ceasefire was implemented we set up base in this village and worked on community projects there. We were running psycho-social activities for children with different therapists, theatre-people; who had worked in art and drama therapy; who would come down from Beirut. We were also running language courses in English and French, documentary film-making workshops with youth ; this was done in an attempt to provide the workshops and skills such as shooting, filming, editing, directing short documentaries in which youth could narrate their own lives in a way they felt could accurately represent their reality on the ground as opposed to continually feeling misrepresented by mainstream media. The collective has continued, it's expanded now into the camps; a lot of these films are downloadable on two websites: [www.cinemayat.org ; www.lensonlebanon.org]. What we're hoping is that people will use them as a resource out here to raise awareness and to listen to people in the first person as opposed to unsatisfactory conduits such as myself coming out. For the last nine months I've been working between two Palestinian refugee camps in the North; one called Nahr al-Bared, the other Baddawi refugee camp. While there I have been volunteering with a womens technical training Palestinian NGO called NijDi Society and also working with a collective of human rights organisations who've been attempting to document human rights violations that went on on the ground during the battle. To use that documentation as a tool for advocacy in terms of trying to counteract the rising wave of racism and prejudice that has been seen on an institutional street level in Lebanon towards Palestinian refugees. There has been a homogenisation in many people's minds between Fatah Islam and the refugee population of Nak Bahrid so it means that the response is quite a hostile one. What we've been attempting to do is highlight the fact that Nak Bahrid was a tragedy on all sides; the narratives of the over 3,000 refugees that were displaced during the conflict were completely silenced. There was a comprehensive media ban; there is a lot of focus in Lebanon on the 165 Lebanese soldiers that were killed during the conflict; what we're trying to emphasise is that there were also 47 civilians killed, over 3,000 people displaced and that the homes, livelihoods and infrastructure of a community have been completely destroyed. In doing so try to catalyse some shows of solidarity, some practical solidarity from a Lebanese community that would have sympathy towards the Palestinian struggle in occupied Palestine, but emphasise that solidarity is lip service unless there is practical solidarity and support for a Palestinian community struggling for civil rights in Lebanon in the camps. C: The motivation was twofold; one was to provide a context, an outline for the present political crisis in Lebanon to try to illustrate the conditions that still exist in the South of Lebanon; the cluster bomb situation, the humanitarian situation; to try and clarify or breakdown the very confusing political scene in Lebanon. The other motivation was to try and raise awareness amongst activists who are already active on the issues of the Palestinian struggle in occupied Palestine; to emphasise the fact that the very corrupt and repressive leadership is not making the issue of the refugee and diaspora communities a priority in their negotiations; is not emphasising the right of return. That we on a grassroots level really have a deep responsibility to state that when we talk about Palestine and the Palestinians we are not referring exclusively to those who are living under the brutal occupation in occupied Palestine but to a much wider community that continue to live without basic civil, social or economic rights; for instance in Lebanon. Or with nominally more rights in other Middle Eastern countries but living in displacement and exile. Then we have a respons-ibility to make this a part of the discourse, to try to put pressure on the media here in the representation of Palestine to stop ignoring what is the majority of Palestinian refugees. A: The Raytheon 9 have visited Lebanon twice, what was their experience and what was the reactions they received? C: The reactions the Raytheon 9 received were overwhelmingly positive, people were very inspired by their action. Ironically I think the Raytheon 9 is more well known in Lebanon than they are in Ireland. They visited both the south villages that were destroyed during last years war and also the refugee camps. I think a symbolic show of solidarity and also for their own awareness raising; to try to get a much deeper first hand account and sense of the war/continuing wars. The visits were great. I'm so used to receiving delegations from a Western context to a Palestinian or Lebanese context, and translating from Arabic to English the words; occupation, exile, sacrifice, displacement, humiliation; etc. Personally it was great to be with a delegation from the North translating from English to Arabic the same terminology and language when the delegation would be questioned about the struggle and history of the struggle in the North. They came to Cona twice and met with families; the victims of the second Cona massacre, as I referred to in one of the meetings [on Irish speaking tour], with Halla the mother of two young girls who suffocated to death under the rubble of their home that was bombed. C: It's very difficult. A lot of the discourse around the Middle East and women's lack of access to independence and rights in many contexts; a lot of Western feminists instead for accessing women, standing in solidarity with them; tend to alienate Muslim women by adopting a very holier-than-thou discourse. Muslim women are very aware of the commodification of women's bodies in a Western context; in that patriarchy is not something that is exclusive to the Middle East, it exists everywhere. I am a feminist, and when I work in the villages in the South I wear a headscarf, just a loose headscarf; because it makes my life a lot easier, I find in some ways working with women in a community where all women wear veils, if I'm looking at building trust and in skill-based workshops to give women more independence; particularly young women. That meeting them halfway; because my struggle is not against the veil, my struggle is against Islamaphobia, my struggle is against imperialism, a lot of issues; through that process of sharing experiences and meeting them halfway, that it is easier to access and then talk about alternatives to the lives they live, of the need for gaining independence, for getting educated, getting skilled-up, for really pushing their rights to have much more representation in their communities, to be actively involved in all aspects of resistance and life. It's interesting I remember once I was doing a talk in Ireland; one of the slides had me in it and I had the scarf on. I got so much flak from the audience for it. I just felt in some ways that if the veil has become such a subject; and there is a lot of societal pressure for women to veil, but also with the growing discourse of Islamaphobia in the Western media; a lot of young Muslim women that I know, would wear it as a sign of identity. It's a twisted sort of dynamic, that something in some ways represents a lack of choice has become a symbol of resistance for a lot of women because a lot of Western feminists are not understanding the issues. They're not going there, being on the ground and trying to promote equality, rights, to fight against exclusion in a real sense. If we stand on the sidelines and condemn a woman because she's veiled instead of looking at the fact that this is an intelligent, capable, educated, active, strong, passionate woman as well as having a veil; I think we're just buying into this whole very racist, orientalist-almost discourse. As a Western woman the only places I would wear a veil in Lebanon would be in these villages on the border; in the camps I don't. I don't see it as a contradiction. In some ways although I have gone through frustrating periods of really feeling a level of condescension and superiority by male colleagues; on the whole as a woman working in a Middle Eastern context I've actually experienced less patriarchy than in other contexts, certainly less patriarchy than in a Latin-American context. I haven't had any problems, it's obviously a long term struggle, it's a part of the struggle for equality in the Middle Eastern context. I do feel that the activist community in the West is not engaging in a level and way that they need to. A: You said that we can not afford to get overwhelmed or burned out by these major injustices that are happening; how can people here in Ireland give effective support eg: raise money for clothes, visits, etc.? C: Because of the way that people are barraged with these images of death and destruction, blood and massacre on their television sets; it's very easy to get overwhelmed, disempowered and burned out. The urgency of the situation on the ground, the world dictates that we can't, that that is a luxury that we can't afford, to throw in the towel and despair and get depressed. We have to remain active, it does have an impact at least on a human level, if not a political translation yet. There are practical things that people can do and are already doing. I don't want to minimise what is already going on, there is a lot of activity, a lot of projects, delegations, exchanges, twinning of communities, direct actions. I think that ante really has to be upped, that support for folks such as the Raytheon 9, for other people that have taken direct action is essential, that a proliferation of those sort of activities, actions; that it would be great if they can take place. Then on top of that, one thing we were discussing last night, was fundraising in the context of it being solidarity and support for their struggle; on the very immediate term people such as in the refugee community in Nahr al-Bared, it would be great if we could fundraise and raise enough money for warm winter blankets, for warm clothes for children, and to support the two clinics that exist in the camps. If that can be done in tandem with awareness raising, with advocacy, with actions; I don't think it undermines it. In this case raising money would not relegate the Palestinian activist community to charity which I know is a fear that people have. I think it can all work in tandem and needs to. Awareness-raising is essential. For additional information on the Palestinian refugee situation in Lebanon see the Amnesty International report Exiled and Suffering ; some older reports by Rosemary Sayigh on the web are also available. See: www.electronicintifada.org and www.electroniclebanon.org for update information of the ongoing situation.